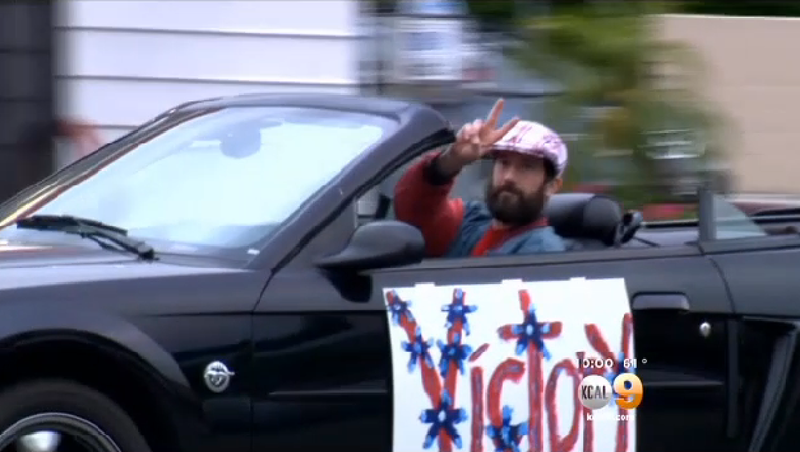 RESEDA, Calif. - A man led authorities in Southern California on a chase at speeds of less than 10 mph Friday and waved to bystanders and flashed peace signs as cop cars trailed him, reports CBS Los Angeles. The chase finally ended after a bystander stepped in front of the suspect's car, according to the station. It's unclear what the suspect was wanted for. The station reports the chase began around 6 p.m. Friday in Reseda and stretched into Tarzana, Encino and then Sherman Oaks. The man was driving a 2004 Ford Mustang convertible with his hazards flashing and the words "Victory Parade" scrawled on one side of the vehicle. On the other side were the words "War Over, We Win." The driver, who was bearded and wearing a checkered hat, often waved to onlookers and even gave a few fist pumps, reports the station. At least eight patrol cars trailed the vehicle and as more and more onlookers gathered on the sidewalks, the suspect began greeting them by flashing peace signs. The LAPD eventually put a spike strip down in an attempt to bring the suspect to a stop, but the driver was going slow enough to avoid it. After about an hour, a bystander -- believed to be a homeless man -- stood in front of the vehicle, forcing the driver to stop. As the suspect exited his vehicle, the bystander pushed him onto a roof of a patrol car, reports the station. Police ultimately handcuffed both of the men. West Valley Police told CBS Los Angeles that the bystander was detained because of a parole violation warrant. It was later determined that it had been taken care of, and he was released. His name is not being released because he is now a witness to the pursuit. LAPD Sgt. Mike Patriquin said the bystander walked a fine line by interfering. Police reminded bystanders to never get involved in police matters as they are potentially placing themselves in the line of fire. Neighbors identified the suspect involved in the chase as Aaron Levy, 38, and described him as a war veteran who lives with his father. Levy has been arrested on previous occasions for what neighbors referred to as bizarre antics. "He has a lot of opinions about certain topics, including government, military, anything like that, and he likes posting them," said Danielle Stein. The neighbors went on to say that Levy is harmless and they often see him spray-painting signs and posters that he puts up around the community.